- Excerpt from Dock Boss by Neil G. Clark, scheduled for release this summer by Barricade Books. It is the story of Eddie McGrath and the mobsters who controlled New York City's West Side waterfront. - Lennert Van`t Riet & David Critchley provide a groundbreaking history of Frank Zito's little-known but influential Springfield, Illinois, Mafia. 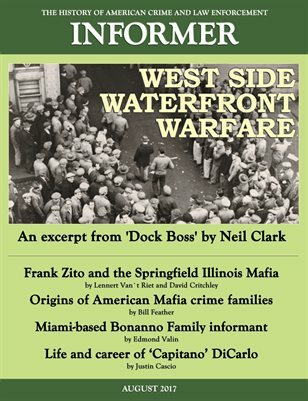 - Justin Cascio explores the career and family connections of the "Capitano," Angelo Di Carlo, who held key underworld positions on both sides of the Atlantic. - Edmond Valin digs through government records to discover the identity of a Bonanno Family informant. - Bill Feather provides details on the founding of twenty-nine United States Mafia organizations. - Richard Warner reviews books on an axe-wielding killer, the origins of street gangs and revered New York law enforcement officer Joseph Petrosino. - In The Warner Files, Richard Warner outlines recent changes in the Chicago Outfit.